Garmin’s fenix 5 includes all the great features found in past versions, but now comes in small, medium, and large sizes. Women will happily note that the 5S, the smallest fenix, is less clunky and better for thinner wrists. On top of that, the fenix 5 has the biggest selection of watch and strap colors of almost any GPS watch. But while the new fenix 5 series looks spectacular, it also comes with a spectacular price tag. Let’s review and see if you it’s the right watch for you…. There are three versions of the fenix 5: the 5S, 5, and 5X. Each comes in a variety of colors, strap options, and lens types (either a standard glass lens or a scratch-resistant sapphire lens). Each is a slightly different size and weight (5S is the smallest, 5X the biggest). What’s fun about the watch bands is that they can be easily swapped without tools. These quickfit bands are secure and interchangeable. Change colors on the go or swap in the metal band and head from the trails to the office. There is one major new feature found on the 5X (the largest fenix). Mapping and navigation functions have been updated and now include turn by turn directions. Prior fenixs had a standard breadcrumb map. But the fenix 5X has real maps with streets, trails, and topo information. 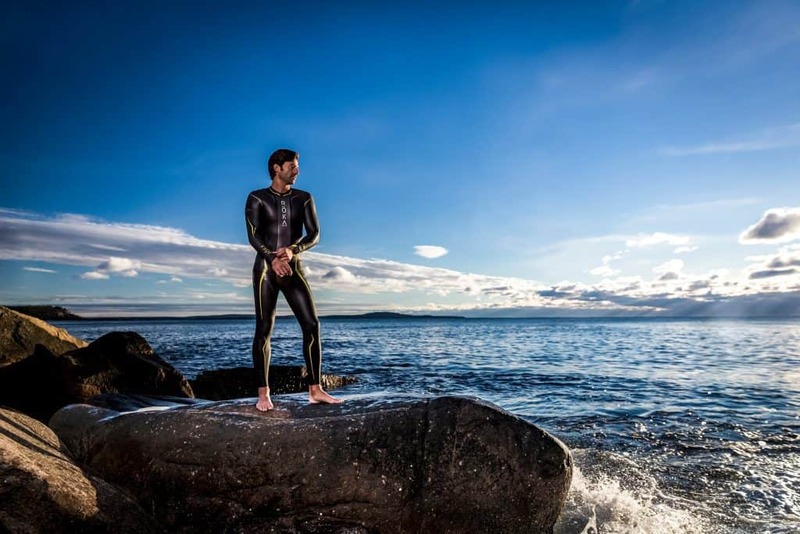 Garmin carried over the numerous features from older fenixs that include everything from running data to swimming metrics to multi-sport mode for triathletes. With the fenix 5, Garmin put a wrist-based heart rate monitor on every version of the watch. Older fenix watches either had a optical HR option or required a chest strap to track heart rate. Battery life has gotten better and worse, depending on how you look at it. With all three versions of the watch, everyday watch mode (non-GPS) has decreased quite a bit. The fenix 5s will go for about 8 days without a charge, 14 days for the fenix 5, and 12 days for the 5x. This is down from over 40 days with the fenix 3. It’s one downside to the wrist heart rate monitor, which eats into battery power. However, battery life increased in GPS mode (i.e. during runs and other activities)… but only in the fenix 5, the medium-sized fenix. That has a 24 hour GPS-mode battery, up 4 hours. But the 5S maxes out at 14 hours – the smaller physical size likely requiring a smaller battery. And the fenix 5X remains at 20 hours. Probably the coolest new feature on the fenix 5 is the mapping functions. But this is only included on the 5X – the largest and most expensive fenix. Pre-loaded Maps. The fenix 5X comes pre-loaded with TOPO US maps and road maps. The maps are optimized to be easily read on the go. If you travel internationally, they only include the larger geographic area where you bought it – so North America for US buyers. Adding additional maps isn’t too hard if you have some semi-technical computer skills. Round-Trip Run and Ride. You tell the fenix how far you’d like to run or ride and it comes up with a suggest route, including turn-by-turn directions on the run/ride. Nearby point of interest (like food or gas stations) are also noted on the maps. And GPS data (like time, speed, distance, etc) can be overlayed on the map so you don’t need to switch between the map and other data screens to get activity metrics. 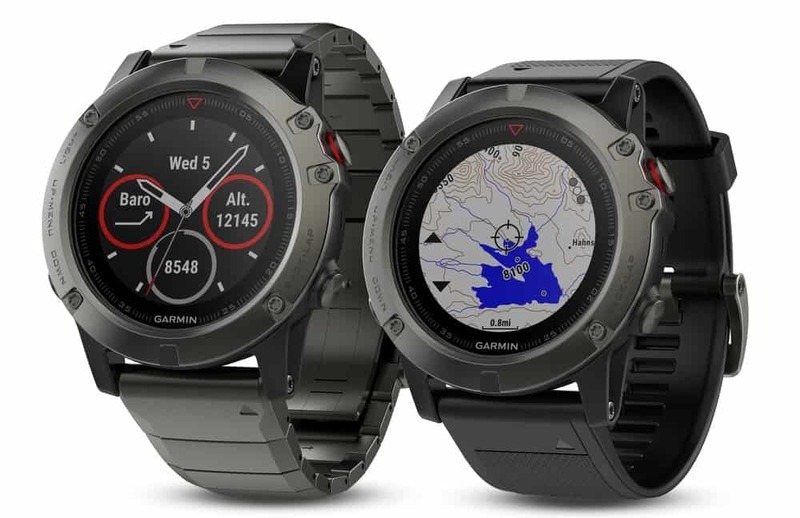 Like some of Garmin’s other recent GPS watches, the fenix 5 series can be loaded with apps and widgets from Connect IQ, Garmin’s online app store (most are free). This includes new types of watch faces or apps that can tell you the weather or help you time your gym workouts. The Face-It App lets you upload any photo and use it for the watch display background. This is done through a smartphone app – any photo you use can be uploaded to the fenix 5. The fenix 5 remains one of the most powerful GPS watches on the market. The features below have been carried over from the prior fenix watches. We’ll cover them briefly here. If you’re familiar with those watches, feel free to skip this section. Activity Tracking. Similar to a Fitbit and stolen straight from Garmin’s vivofit, this counts steps, creates daily step goals, tracks sleep, and provides Move alerts if you’ve been sitting too long. Swimming. As with the fenix 3 and Garmin’s other triathlete watches, the fenix 5 tracks swim metrics like distance, pace, strokes – both in the pool and in open water swims. Cycling and Triathletes. The fenix 5 can be programmed with multiple bike profiles, nice if you own multiple bikes. And supports Garmin’s cycling accessories like Vector power meter, Varia lights, and the bike speed/cadence sensor. Virtual Pacer/Racer. These long-standing Garmin features let you train with a “virtual person” who maintains a consistent pace or mirrors your prior workouts you’ve done in the past – read more about them here. Music. While listening to music on your phone, you can remotely play, pause, and skip tracks with the fenix 5. Find My Phone. I actually used this a couple times – it works great! There is an alert sound from your smartphone along with a gauge on the watch display. It won’t work for long distances like the iPhone app – but perfect if you misplace your phone in your house. Golf. Yes, golf. This includes a digital scoreboard. Shot yardage. And yardage distance to the front/middle/back of the green as well as yardage to doglegs. New the fenix 5 is additional golf info like stat tracking, round timer, and harzards and course targets. Paddle Sports. The fenix 5 tracks stroke count, stroke rate, and measures distance per stroke for kayaking, rowing, and stand-up paddle boards. Advanced Running Dynamics. When using the HRM-Run heart rate monitor (this is the chest-strap HRM), the fenix 5 tracks more running metrics like vertical oscillation and ground contact time. Read more about those here. Smart notifications. This is one of my favorite features on Garmin’s newer watches. Any alert that appears on your smartphone (text, Facebook notification, phone call) appears on the fenix 5. It makes it easy to decide whether you should stop and answer that text or ignore and keep running. Bluetooth. Bluetooth is what allows the smart notifications but it also makes it easy to upload workouts to Garmin Connect, via Garmin’s app. Wi-Fi (fenix 5X only). 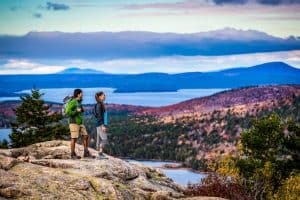 Like Bluetooth, the fenix 5X automatically loads workouts to Garmin Connect through your wi-fi network. Ski/snowboard mode. While skiing or snowboarding, the fenix 3 detects when you’ve finished on run and boarded the chairlift. It auto-pauses on the lift and marks a lap. Vertical Speed. Great for skiing and snowboarding, this features tracks your speed while moving up or down. Altimeter. Elevation but with a barometric altimeter. In other words, it’s way more accurate than GPS elevation common on most Garmins. Electronic compass. A basic compass. Gyroscope. Use to improve navigation while the watch is in ultratrac mode (extends battery life but less accurate for speed and distance). Temperature sensor. While this seems like a good idea, the temperature can be thrown off by body heat. On-screen Breadcrumb map and huge waypoint storage. Pre-fenix 5X, this is how mapping is down on Garmin’s watches. It’s a basic line showing where you are and a series of small dots showing you where you’ve been. 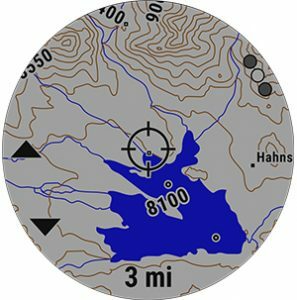 Waypoints – or points of interest – can be added to the map pre- or during the activity. You can also upload pre-defined routes that show you where are on a specified route. Track Back. Find your way back to where you started. An basic arrow gives you the general direction where you need to go to get back to the start (following the same route you started). If you detour off the route, it points you back onto the route. Auto-lap and auto-pause. Laps are automatically marked are specified distance – default is 1 mile but that can be adjusted. Auto-pause stops the timer when you stop. There is often a delay of 5-10 seconds between when you actually stop and the fenix stops. Live Tracking. This let’s people track you on their phone or computer in real-time. Great for large races and other big events. The downside is you need to carry your phone with you. With its mix of performance and style, the fenix 5 series is Garmin’s most comprehensive GPS watch. It’s got wrist-based heart rate, tons of features, and a great battery life. The 5X version has great mapping and turn-by-turn directions. But it’s big, heavy, and expensive. The other models are smaller and better for thin wrists. All of the fenix 5s come with a ton of strap and color options. The fenix 5 is great if you want a functional and stylish watch. 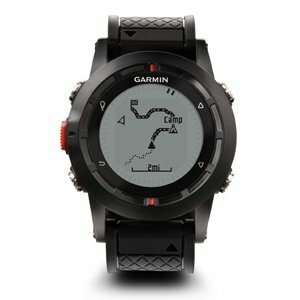 If you are less concerned with how it looks, the Forerunner 935XT has all the same features as the fenix 5 (excluding the mapping options on the 5X) for a $100. That might be a more economical option for most people. But you’re not going to go wrong with any of the fenix 5 watches. The fenix 5 is great for running on the road or trail. Huge battery life for long runs, marathons, or ultras. Road maps and terrain maps can be loaded onto the 5X version. No easy way to mount the fenix 5 to your bike, but it’s got all the cycling-appropriate features. Mapping on the fenix 5X could be useful for cycling. The smaller screen could make it tougher to read while riding. Great. The fenix 5 is water-resistant and has all the swim-related functions as Garmin’s other swimming watches. Navigation, battery, and mapping make this watch perfect for hikers. Vertical speed and the auto-pause and auto-lap for each ski run make this a great choice for downhill skiers and snowboarders. Long battery life and navigation features make this watch perfect for trail and ultra runners.